When I was deciding which fragrance samples to order from 4160Tuesdays, I knew that New York 1955 was one I couldn't omit. After all, I grew up listening to my grandparents' and parents' tales of the New York City in the 1950s, and this fragrance is a tribute to that era. It belongs to 4160Tuesdays' "Vintage Tuesdays" series, described as "new scents, made the traditional way with authentic materials." 4160Tuesdays creator and perfumer Sarah McCartney writes, "One of my favorite vintage 1950s scents was Coty's Chantilly, named after the French town famous for its whipped cream and intricate lace. 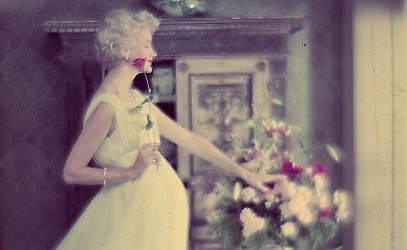 [New York 1955 is] a soft strawberry and cream perfume, decorated with crystalized rose." The list of notes for New York 1955 includes candy floss (or cotton candy, as we call it in the United States), raspberry, rose, violet, vanilla, ambergris and musk. I've never tried Chantilly, but I'm partial to nearly anything with violet and rose, and I have a weakness for sweet (yet sophisticated) perfumes. Maybe it's just the description of this fragrance as "a bright, shiny, ice-cream soda scent" that makes me think of dessert, but New York 1955's opening reminds me of a dish of lime sherbet, with citrus-sweet topnotes that melt into a mix of bold red berries and shocking-pink roses. New York 1955 feels like a Technicolor production for its initial half-hour, but then it gradually takes on the lush yet muted tones of an old photo from the 1950s. Its heart is a beautiful mix of rose and violet, and as it dries down I think I can detect powdery iris and heliotrope. New York 1955 has above-average longevity, leaving a soft kiss of candied violet and vanilla at the end of the day. If you have an aversion to perfumes with sugary florals or an overdose of vanilla, New York 1955 probably won't thrill you; however, if you read my reviews on a regular basis, you might know that I love nothing more than a rose-violet perfume with a nostalgic feel, provided it's well-executed. New York 1955 is right up my proverbial alley. It calls for heels, a full skirt, a swipe of lipstick; but it also has a sense of humor, so you needn't reserve it for evenings out. It even has a reasonable price point (under $100) for a niche fragrance. (For reference, the flat and derivative Maison Martin Margiela Lipstick On costs $125 and Guerlain's overblown rose-berry-and-violet French Kiss goes for $260). If you love Frederic Malle Lipstick Rose, Bond no. 9 Broadway Nite or Les Parfums de Rosine's La Rose de Rosine, or if you just think you might enjoy a powdered-sugar-and-flowers valentine of a perfume, you should seek out a sample of New York 1955. It's my personal favorite from 4160Tuesdays, so far, and I'm adding it to my wishlist. 4160Tuesdays New York 1955 is available as 50 ml ($90) Eau de Parfum. For purchasing information, see the listing for 4160Tuesdays under Perfume Houses. Note: top image is Fashion Model Sunny Harnett in a photo taken by photographer Edgar de Evia. © Edgar de Evia; [cropped]; via Wikimedia Commons. Thanks for the interesting review, Angela. I have mixed success with this kind of perfume; I like Drole de Rose and Broadway Nite (I also love Insolence, rose and violet for sure but maybe too loud to be considered similar to these others), but am not particularly fond of Lipstick Rose or Misia. I haven’t tried anything from this line but this one may tempt me. Hi Bastet, and thanks! This review was from me — if you’re not a fan of LR or Misia, this one may not win you over — it does have that powdery vintage-cosmetics feeling. However, the line does offer an interesting range of experiences — it’s good fun and quite creative. Sorry Jessica – I was obviously confused. I was delighted to see this review, thanks Jessica. I bought a vintage bottle of Chantilly a couple of years ago, and will have to try this. It actually sounds closer to Misia than Chantilly, but I like both so can’t go wrong. You’re welcome! For some reason, I don’t love Misia as much as everyone else does — it’s very elegant, but I feel like I need a little more frivolity, a la Drole de Rose or Lipstick Rose! This one also feels more “colorful” than Misia in his earlier stages, but the heart and base are something that Misia-lovers might enjoy. I think I may have to try this as I love Misia. I have not tried anything from this perfume house, but I know several others have made positive comments about 4160Tuesdays. I will need to sample this as I have fallen in love with Lipstick Rose. Thank you for the lovely review and the photo you used was what initially captured my attention. Ah! That’s good to know! I was looking for a glamourous 1950s fashion shot that fit the mood, but most photography in that category is still copyrighted. Glad I found this one! Thanks for this review, Jessica! I do have a fondness for cosmetic scents, but of the more powdery kind, not the waxy ones. It sounds like it may be similar to the rosy-berry rice powder of the Huitieme Art Poudre de Riz I just got(and love) but next time I place a Luckyscent order I’ll add this to the list. Love Sarah’s work! The number in the article title is wrong. Just fyi. Mine says 4170. Jessica’s planning to live for an extra 10 Tuesday’s ! That’s odd. Her website is 4160 Tuesdays. I typed it wrong! argh. That’s what happens when I stay up past my bedtime to finish a NST review! I’ll ask Robin to correct that. Hate when that happens! And sadly it happens all to often! LOL! You know, I never cared for the old Chantilly (which was, by my memory, Houbigant/Dana rather than Coty) at all, and I’m kinda hit-or-miss with makeuppy-powdery florals*, and the three or four 4160 Tuesdays fragrances I’ve sampled have generally not impressed me, except for Lady Rose Lion Monkey Unicorn. However, I’m thinking I might have to sample this one. * Haaaaated Love, Chloe for the harsh baby-aspirin note, found Lipstick Rose way way way overpriced, and thought Misia was too austere. I do like Broadway Nite quite a bit. Hmm. Not chastising you for the “Coty Chantilly” quote, btw, since it’s the perfumer’s, but I was puzzled by it. Is it owned by Coty now, as so much else is? Just went and checked Coty’s website (here: https://www.coty.com/brands#block-quicktabs-brands ) and they don’t list either Dana or Houbigant. Funny how we all have different tastes. I love both Misia and Love, Chloe. However, there are many scents that others love and I have no interest in. I hated Love, Chloe too. I’m very fond of Broadway Nite! I have fond memories of “old” Chantilly so this sounds wonderful to me. Thank you for sharing this review with us. I’m glad! I need to track down some vintage Chantilly. I remember the ads from the 1980s version — lots of lace and pouty lips!! I haven’t tried New York 1955 yet (and I’m not such a big fan of sugary sweetness) but Tokyo Spring Blossom is another rose-violet from 4160 Tuesdays, which I like very much. It has a touch of raspberry and citrus too. I have that one (with its previous name) and suspect NY1955 is unnecessary for me. Elizabeth, knowing your taste, I think you’d enjoy sampling New York 1955!! The name of the perfume suggested a chypre to me – until I studied that wonderful image you found. No, not a chypre then! This one does not sound like my sort of thing, sadly. For a chypre I should be looking to ‘Paris 1955’ perhaps. Hello, Annemarie — no, this one is definitely not a chypre — but 4160Tuesdays does offer several scents inspired by classic mid-century chypres!! I think Mals is right: Fragrantica lists Chantilly under both Houbigant and Dana as a 1941 perfume, not under Coty. It’s indeed puzzling. I have a small vintage bottle somewhere, but it must be hiding behind something else at the moment. I don’t remember it smelling anything like the name Chantilly or the 4160 Tuesdays description (any more than Blue Grass smells like grass). I don’t think it was light and fluffy, despite the name. But perhaps it seemed so compared with Tabu. I managed to find my vintage Chantilly today! I guess it does suggest the idea of the Chantilly dessert up top if you find real sandalwood creamy and notice a hint of maraschino cherry. But it’s a heavy perfume by today’s standards, with the soapy-powdery aldehydes in addition to that real sandalwood, and not sweet or fruity. Think Chanel No. 5 rather than Misia. I remember Chantilly from back in the day, and you’re right, it is very un-fluffy.